Made quickly in a saucepan and with only three ingredients, this icing is hard to beat! It is so fudgy and has a nice sheen. Just whisk in a bit of powdered sugar to turn it into a really nice frosting as well! Cakes, cookies, cupcakes, graham crackers, spoons, fingers... you name it, I'll try to frost it! Ok, maybe not brussel sprouts. But to be fair I haven't tried it yet so I'm not going to completely rule it out! Nah, I'll keep my brussel sprouts simply roasted and sprinkled with bacon! I know we went over this last week, but I thought we might need a refresher. 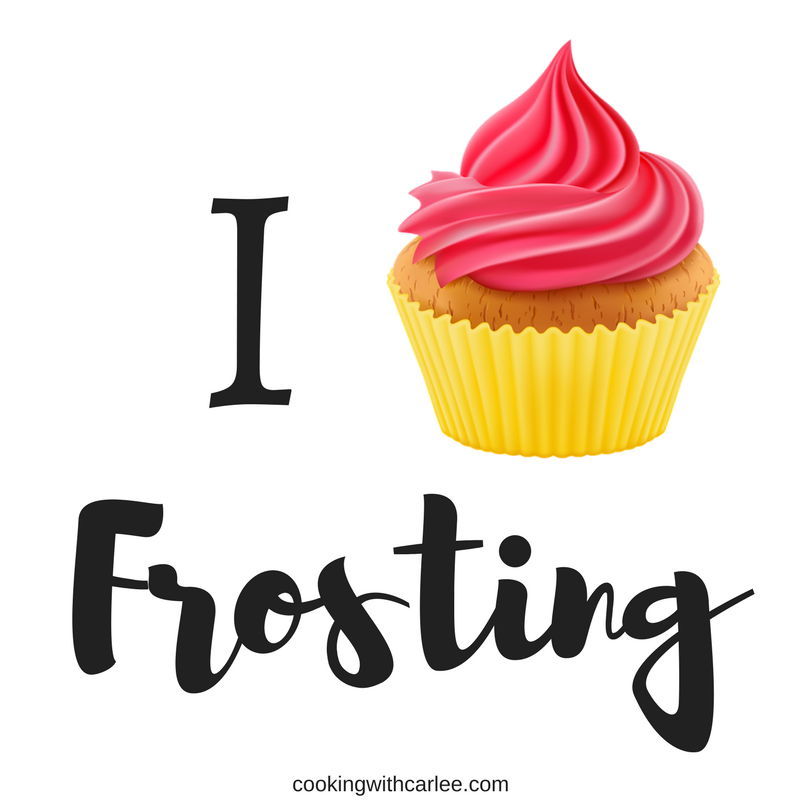 Frosting is awesome! Though I went ahead and called this icing because it doesn't stand proud like frosting. Instead it is self leveling, so that makes it icing right? I suppose I need to brush up on the terminology if I'm going to profess my love for them every week, huh? Either way, this stuff is good! 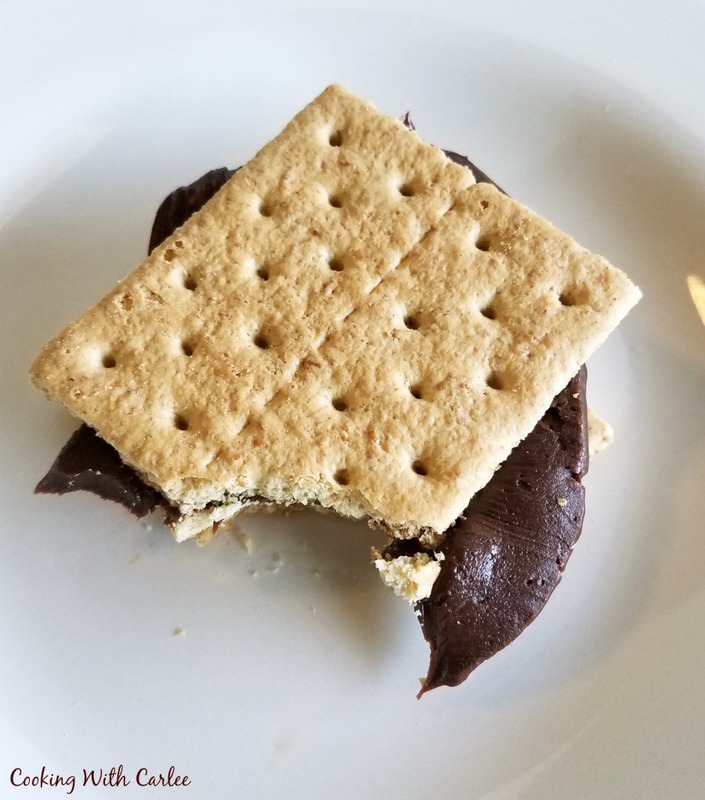 Just a few simple ingredients melt together to make the fudgiest, yummiest topping for whatever baked good you're eating. The hardest part is waiting for it to cool, but it's worth the wait. You'll get a thicker cover and fewer drips if you can hold on for ten or twenty minutes. When I whisked in some powdered sugar, it was able to hold it's shape quite well. If you are looking for a thicker frosting, I would recommend going that route. Now I would not recommend using this as written to frost a layer cake. Even cooled, I think you'd be cursing yourself as you try to work your way around the sides. I did experiment with whisking in some powdered sugar though and that would help immensely if you're trying to scale a cake. As is, this is a perfect coating for cupcakes, cookies, sheet cakes and more. 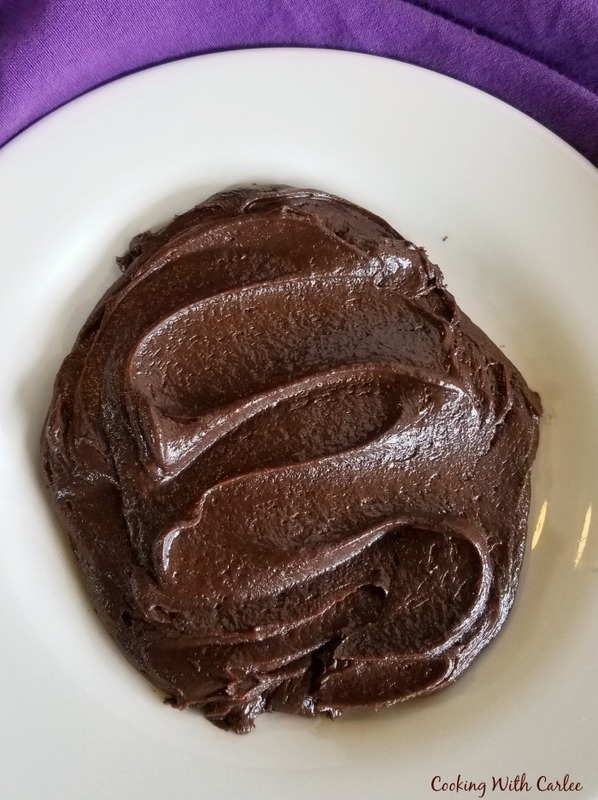 It is so fudgy and not too sweet. It spreads nice and soft so it is easy to get a smooth finish and then sets up so you can touch it without marring it after an hour or two. 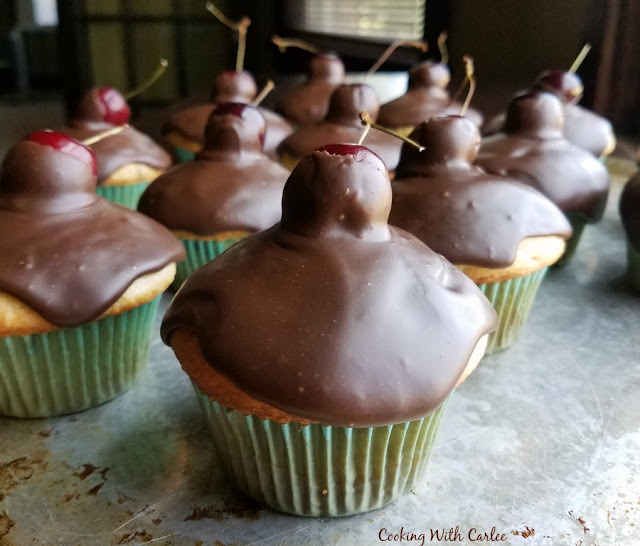 I just loved the way it topped the cherry chip cupcakes I made. I also dipped cherries in the extra icing and put them on top. That made for a super fun presentation, don't you think? I also think it would be lovely on Di's banana cake, some shortbread cookies or drizzle the heated up leftovers over some homemade ice cream! What's the first thing you're going to try this icing on? In a large saucepan over the lowest possible heat setting, melt together the chocolate chips, butter and sweetened condensed milk. Stir constantly to avoid scorching your chocolate. As soon as the mixture is smooth, remove from the heat. If you want frosting with more structure, go ahead and whisk in some powdered sugar. If you want more of an icing, leave as is. Cool for 10-20 minutes and then spread over cake/cookies etc. The icing will set as it sits. Be careful when touching them in the first hour or two, after that they should be easier to handle. The whole idea of fudgy and sweetened condensed milk just makes me super happy!!! YUMMINESS!! It is perfect for smoothing over some cupcakes, Andrea! Thank you! Oh my gosh, this looks absolutely amazing!!! I'd actually say compared to a lot of the frotings I make, it isn't too overly sweet... but definitely rich! But since it smooths out in a thin layer rather than piled high like buttercream, it is just perfect! Thank you! It sounds better than that frosting that we used to whip up and eat like pudding. Maybe we'll just cook some up and have a frosting party! It sounds good enough that we could. We didn't even have sweetened condensed milk or powdered sugar in that frosting in the good old days. 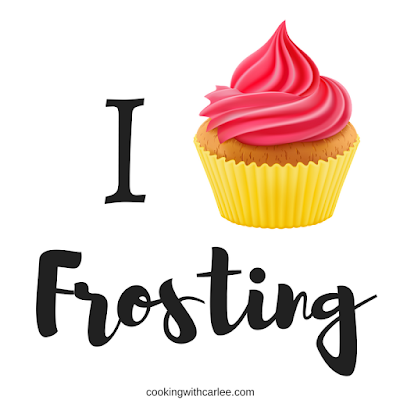 Thanks for sharing this frosting recipe. Can I come to your frosting party?! I love that idea! I'm with you! Pass me the bowl and a spoon and I am happy as a lark! I love frosting with saltine crackers! Hope you have a fantastic weekend and thanks so much for sharing your awesome post with us here at Full Plate Thursday. We hope to see you again real soon. Mmm! Now I want a sleeve of crackers and some rich fudgy frosting!